Following from the success of our checkIT routine check software we set about building a more specialised system for doing negative pressure rooms. The aim of the build is to keep the simple interface, optimised for mobile whilst delivering a comprehensive standards compliant report to “our clients client” that they can use to ensure their own quality procedures are followed. You can see what we came up with to the left. This formation is generated from the same securely stored database that out standard checkIT system uses and provides a clear and concise reporting mechanism for the checked data points that you need to ensure your room is both functional and compliant. The system responds instantly, providing the stakeholder emails at the time of inspection. This project has been really satisfying as it has underlined just how powerful the checkIT system is. Anyone who needs a comprehensive check system can now take advantage of this project as the system recognizes a negative pressure room request through the name and template (which we provide for your use) to seamlessly generate the reports. 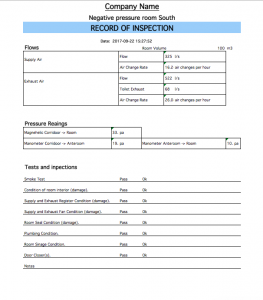 If your contractors are not getting you good reports in a timely fashion, maybe it’s time you asked about Yimelo’s latest checkIT project so you too can have the advantages of instant, compliant records of your negative pressure rooms.